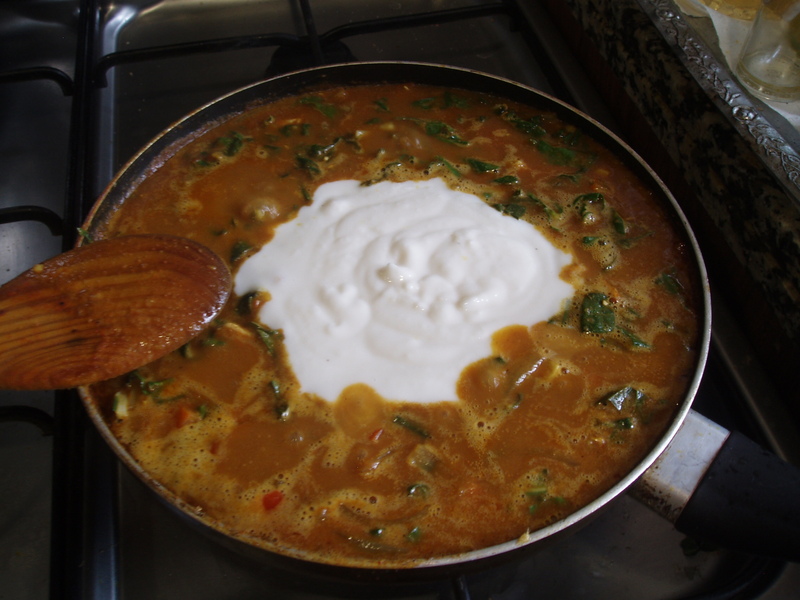 As Big Man was out and about today, and not home for lunch as he usually is, I thought I´d make the most of the opportunity to cook a curry – he´s not a big fan of them. So, not having a ton of spices to hand but finding a jar of curry paste in the “despensa”, that´s a Spanish Larder, I concocted something quick-ish and delicious from what I found in the fridge. Please bear in mind that I am not great at giving measurements. This recipe could well have been made with no meat and lots more different vegetables. I also like my curries with a lot of “sauce” so how much water you add to your curry is entirely up to you. Start with a mug full and when is has reduced stop, if you like it “drier”, or add another mug and reduce just a little more. It´s all down to personal taste. 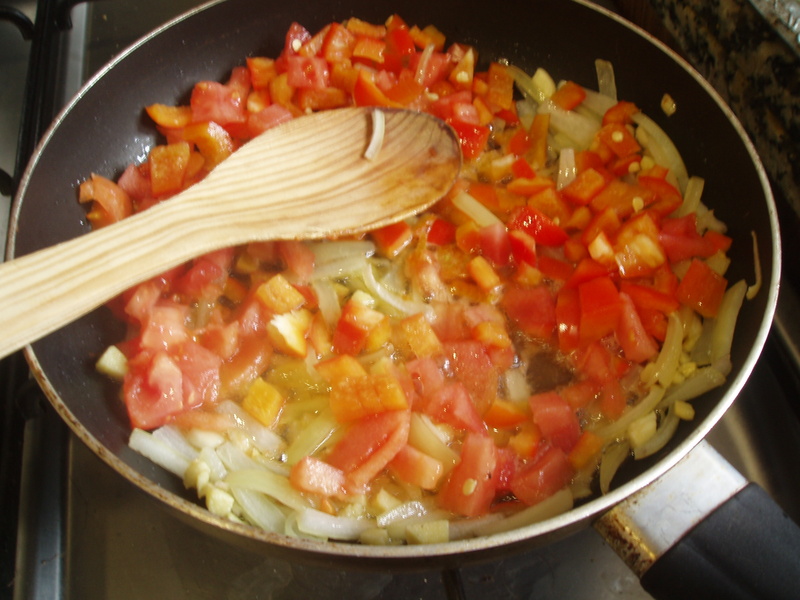 So, in a medium (but deep) frying pan I softened the onion, garlic and ginger in about a tablespoon of oil for several minutes until it was transparent then added the tomato and red pepper for a further 5 minutes or so. The heat was low to medium, so everything was “sweating” rather than frying. Then I added the curry paste which I cooked off for about 2 minutes then threw in the chicken pieces, stirred it around for a few moments and added a mug full of water and the lentils. I let this reduce, then added the shredded chard (but you could use spinach or just leave it out) and another mug full of water. 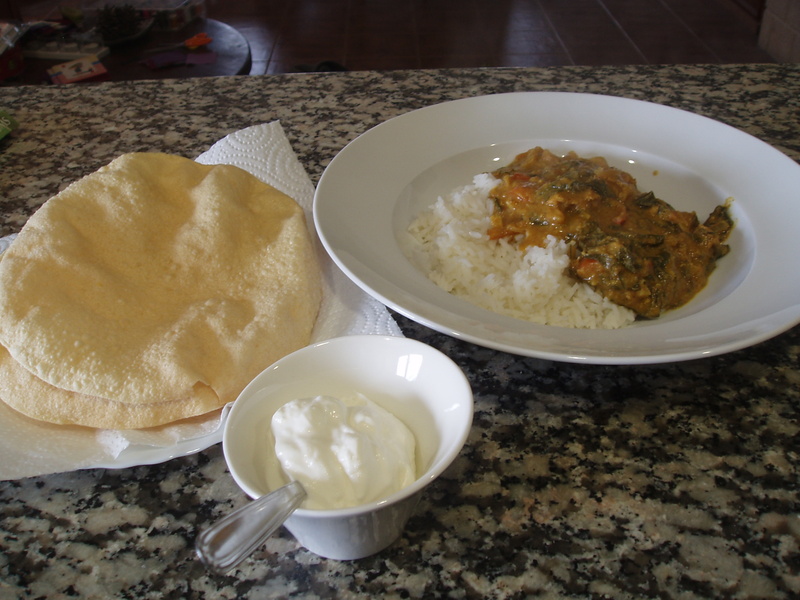 I served it with basmati rice, poppadums and a small bowl of yogurt to dollop and dunk. or just me today and leftovers tomorrow. Enjoy! I just want to tell you that I’m new to blogging and site-building and actually savored your web blog. Likely I’m likely to bookmark your blog post . You certainly come with tremendous well written articles. Cheers for revealing your blog site.